The Feast of the Holy Trinity differs from the other three high festivals of the Church Year. Christmas, Easter, and Pentecost all celebrate the mighty acts of God for the salvation of mankind. Today’s festival, on the other hand, celebrates an important and mysterious article of the Christian faith, namely, that the true God is one in unity and triune in persons. The three articles about God, the Father, Son, and Holy Spirit are the distinct symbol of the Christian Church. Redemption and salvation of mankind rests in the true knowledge of the Triune God; not in the mere knowledge that there is a triune God, but in the actual knowledge of how Triune God has revealed Himself in the work of our redemption. The true knowledge of the Triune God is the foundation of our salvation. What makes the Athanasian Creed so jarring is not its length, but the sentences at the beginning and then end: “Whoever desires to be saved must, above all, hold the catholic faith. Whoever does not keep it whole and undefiled will without doubt perish eternally.” And “This is the catholic faith; whoever does not believe it faithfully and firmly cannot be saved.” How could we confess such strict things about God, as to say that those who do not have the true knowledge of the Triune God cannot be saved? But, we object, we know so many honest, religious people who just believe a little differently than us. Does this mean their beliefs will lead them to damnation? As Christians, we recognize God the Father in the Holy Trinity in the sending of His dear Son. Outside of Christianity, God the Father is seen as a mere creator and sustainer of the world, if those outside of Christianity even recognize a prime mover in the universe. The Father is seen as an affectionate sort of fellow, but a weak father of His naughty children. He cannot but look at His children’s sins as an earthly dad looks at the misdeeds of his own children. He shrugs his shoulders and tries to show His disapproval at what they say and do. Christians even get caught up in this false understanding of our heavenly Father. Consider Nicodemus. He tells Jesus: “Rabbi, we know that you are a teacher come from God, for no one can do these signs that you do unless God is with him.” God the Father is a wise man. He’s done a lot of good for people. He’s blessed our nation. He’s even given us prophets and wise men like Jesus Christ. As Christians, we recognize God the Son in the Holy Trinity in His working salvation on our behalf. Again, consider Nicodemus’ misplaced confession of Who Jesus is: You are a teacher come from God. As Nicodemus reckons it, Jesus is another teacher in a long line of great teachers sent by God, along with Moses and Elijah. If Jesus is just another Rabbi or Prophet, then perhaps others will come like Muhammad or Joseph Smith. Nicodemus does not recognize Jesus as the true Son of God, the only one who fulfills the Law which promised a prophet like Moses, and the Prophets who foretold that the virgin would conceive a bear a son whose name means “God with us” (Deut. 18:18, Isaiah 7:14). Jesus is still held by some as a great moral teacher. Oh, sure, He is also God’s Son, but in the way that we’re all God’s children. Sure, we’ll call Him Savior, but only because He shows us the right way to live. He is merely a man. The way to heaven is through Christ, but only if you follow and do everything He tells you. For those enslaved by a fleshly understanding of the Son, we are saved because Jesus modeled the way. We also recognize God the Holy Spirit in the Holy Trinity in how He makes the salvation ours through faith in Christ. Trinitarians are accused of not giving the Holy Spirit His due because we don’t look for extraordinary signs, tongues, or ecstatic experiences. But without the Holy Spirit, none of us could believe this “catholic faith.” We confess with Luther’s Small Catechism, “I believe that I cannot by my own reason or strength believe in Jesus Christ, my Lord, or come to Him.” Many Christians today deal with this inability to believe in Jesus as a matter of reason or strength. Reason says maybe the Gospel just needs to be shared in a more appealing or compelling way. Strength says that some people just aren’t as devoted to following God as “we” are. The true knowledge of the Holy Spirit is to confess Him as true God with the Father and Son. He is the third Person of the Triune God, co-eternal, majestic and glorious, Who with the Father and the Son actively engages in the salvation of men. “Do not marvel that I said to you, ‘You must be born again.’ 8 The wind blows where it wishes, and you hear its sound, but you do not know where it comes from or where it goes. So it is with everyone who is born of the Spirit.” You must be born again, meaning you cannot bring yourself. The Spirit must bring you and He must work faith and bestow heavenly birth to you. He also works powerfully in the hearts of men through the means Christ gives His Church—the Word and Sacraments. He enlightens them and regenerates them into children of God by faith. “This is the catholic faith; whoever does not believe it faithfully and firmly cannot be saved.” No one can give this faith to himself. It is an incomprehensible mystery to man, even to Nicodemus: “How can a man be born when he is old? Can he enter a second time into his mother’s womb and be born?” You can no more contribute something to yourself when it comes to faith as you can to your physical birth. You are born flesh of flesh. Only God works this miracle by grace. God wants to work this miracle in everyone, so He lets His Word be preached to the ends of the earth. So today, we bid farewell to the Festival Half of the Church Year and welcome once again the Church’s Half of the Church Year. Over the next several months, we will focus on the work of the Triune God on the Christian life. The Word of the Lord grows both outwardly and inwardly when we get out of the way and let God do what He does best: make disciples of all nations by baptizing and teaching. He gives this marvelous mandate to His Church, both pastors and people who work together to strengthen one another and bring others into the ark of the Church. “Blessèd be the Holy Trinity and the undivided Unity. Let us give glory to Him because He has shown His mercy to us.” (Introit for Holy Trinity) Amen. 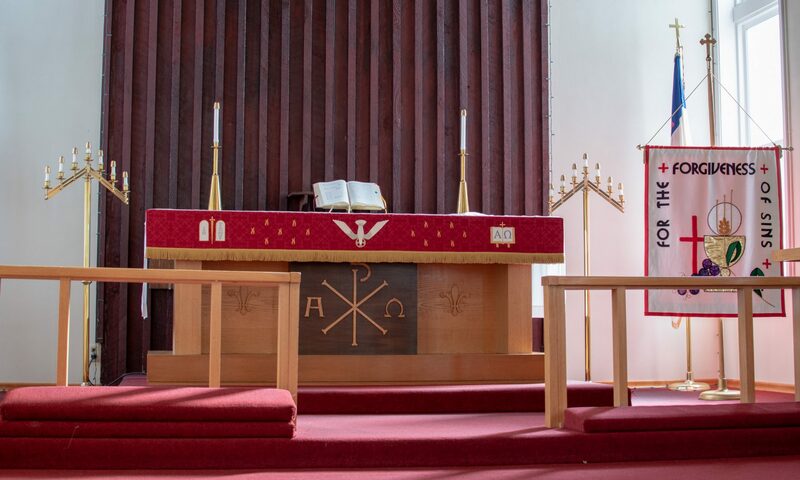 What’s not so beautiful is the statistic that half of confirmands leave the Lutheran confession for box churches, or leave the Christian church entirely. Many congregations see the effect of this and wonder where all the middle-aged and younger people are. Studies are proposed, blame is assigned, and surveys are conducted all to figure out what happened. Worrying that we will lose our confirmands amounts to idolatry of self. Yes, really. If only we were clever enough to come up with an attractive youth program, if only we had one of those praise bands that people say the kids like (but secretly it’s them who are bored with liturgy and hymnody), if only our pastor were a miracle worker who could use a shepherd’s crook to draw in more people (and of course the kind of people we think God’s church needs). You hear the common thread with all these suggestions? It’s our work that we’re worrying about. Now it’s possible that curmudgeonly Christians could drive people away by being overly judgmental and cold toward people they view as outsiders. It’s possible that the young woman who makes a bad decision and gets pregnant, is shunned by people who claimed to be her church family. But assuming we’re a sincere Christian congregation that endeavors to love everyone, there’s another place to look for keeping confirmands in the true faith. For the past two years, these young men have read, learned, and inwardly digested God’s Word. They have regularly and faithfully given up their Sunday afternoons and been immersed in the Word of God. But that’s just two years of their life. Once they’re free from their parents telling them to go to Junior Confirmation, they might decide sleeping in is preferable, or hanging out with their friends who aren’t burdened by religion and have the whole weekend to themselves. The same goes for when they move out after they graduate. If they go away to school, their parents have no control whether they keep going to church or not. These young men are here today because of the work of the Holy Spirit (and yes their parents brought them), but the day is come for us to rely on God the Holy Spirit. Recall that at one time, many of you were in the same position, and here you are today. Others never were, and yet here we are today. Our Lord teaches us in John 3, “8The wind blows where it wishes, and you hear its sound, but you do not know where it comes from or where it goes. So it is with everyone who is born of the Spirit.”” (John 3:8) Even though on Pentecost, the disciples were given a vision of the Holy Spirit’s work, now we simply see His working much the same way we see the trees blow in the breeze. We now hear His voice (the Word of God) and we see men born again, confess faith in the one-and-only Savior, and remain true to Him. We see boldness and sacrifice when these men and women put their faith above other things in life. We feel a peace which the world does not give, because we have a God who rules over the heavens and has secured our eternal home. We do not see this, the way the world sees, but we know and confess that it is the Holy Spirit who does all this. It’s a reminder and comfort for all of us, when we worry about the state of the Christian church in this place, other parts of the country and world. We long for the days when churches were packed and out the door, but I can almost guarantee you that was not just the Holy Spirit at work. It was social pressure, it was the fact that there was nothing on TV and the stores were closed. But in the midst of social pressure and so many distractions, the Holy Spirit’s work comes into better focus. Our Lord promised, “On this rock [the confession that Jesus is the Christ, the Son of the Living God], I will build my church, and the gates of hell shall not prevail against it.” (Matthew 16:18). That promise remains true no matter what year it is, no matter what ideas are popular today, or who you meet on the street. The Church is the creation of the Holy Spirit, and what He creates is more powerful than anything in this passing life. So, our hope is in the Lord who works all of this. No need to worry, no need to devise plans, only pray and believe the promise in Philippians 1:6: “He who began a good work in you will bring it to completion at the day of Jesus Christ.” Amen. This is most certainly true. Don’t be fooled by the title, “Old Testament.” It’s not old like your flip phone that sits forgotten in the junk drawer. It’s not old like an old clunker that rattles when it gets up to freeway speeds. It’s old in the way that it came before the current generation. It spans more time than what is new, and yet still remains true. It’s old because the new came—but unlike the old sinful nature and the new man—both Old and New Testaments are priceless. The Old points ahead to the New, and the New builds on the Old. In fact, neither is complete without the other. The Old Testament is left longing for fulfillment, and the New Testament is no more than a story about quirky followers of Jesus without what came before it. The Old is therefore full of shadows, but the flesh of Christ which casts that shadow is in the New. In Baptism, God adopted us as His own children and became our Father, but how is our prayer life? Do we talk to him constantly or do we put him in the proverbial nursing home and only visit him on Sundays or when He nags us? In Baptism, God joined us to Christ in His innocent suffering and death, but how often we find ourselves weighed down with a guilty conscience, living things over again in our head. In Baptism, we were also made fellow heirs of Jesus’ resurrection, but we magnify the cares of this life so big that even God couldn’t help us when finances or health are at risk. What God did for you in the water of Holy Baptism is not just in the rearview mirror. It’s right in front of you today and it still holds true for tomorrow. While in it you have the forgiveness of your sins (“clean water to cleanse you from all your uncleannesses”), Baptism is the foundation for our whole life as Christians. Uncleanness in the heart spreads to the rest of the life. As Jesus said, “45The good person out of the good treasure of his heart produces good, and the evil person out of his evil treasure produces evil, for out of the abundance of the heart his mouth speaks.” (Luke 6:45) An unclean heart will give birth to many evils, even among church-going Christians—adulterous thoughts, jealousy, greed, pride, doubt, gossip, factions, rebellion. Left unchecked, it just keeps festering and even growing. The insidious thing is when we turn a blind eye. It’s much more comfortable to point these things out in others than to be naked before God, exposed by His holy Law. That is precisely God’s purpose: to expose our uncleannesses and the ways we have profaned His Name among the people we live. It’s to bring us to our knees and empty us of excuses and pointing the finger. But God brings glory to His Name by sprinkling you with clean water—“not as a removal of dirt from the body but as an appeal to God for a good conscience” (1 Peter 3:21). But God is not done yet. Jesus ascended into heaven in order that He could send the promise of His Father (Luke 24:49)—the Holy Spirit. “And I will put my Spirit within you, and cause you to walk in my statutes and be careful to obey my rules.” It’s God’s action which comes first, then the obedience. As Jesus said, “The good person out of the good treasure of his heart produces good.” God’s Spirit keeps us in this faith, and causes us to live godly lives.